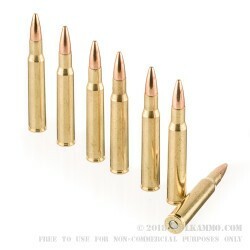 Marketed directly to M1 Garand owners, this .30-06 ammunition is a very high quality round for the cost. It offers impressive accuracy, reloadable cases and a very reliably feeding engineering profile to ensure it can feeds well and shoot well in the M1 Garand. 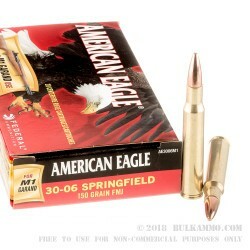 The 150 grain bullet hits the sweet spot for the M1 Garand and the American Eagle ammunition that is produced for this use case offers thick, premium brass that can be reloaded multiple times and is easily done so, thanks to the Boxer priming and the clean powder burn. Where it is suitable for hunting (check your local/states regulations) this FLJ bullet can easily be used on very large game without concerns. This American Eagle load is indicative of the overall quality coming out of the Federal factories for this line and it eschews frills in favor of utilitarianism. 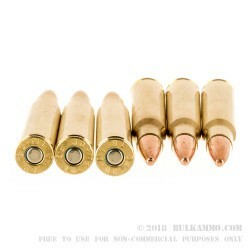 These rounds fire every time and they are at least as accurate as your standard hunting ammunition, especially when paired with the M1 Garand, as it was custom designed for that purpose. 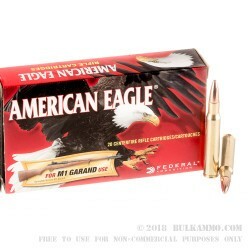 As long as you are cognizant to the barrel twists and the accuracy and feed concerns that are unique to the Garand, this ammunition could easily play double duty in another firearm, particularly a bolt action.